A medieval parish church with a 12th century round tower and early 14th century aisles. The church was extensively remodelled in the 15th century when new windows were inserted and the porch was constructed, and it was restored in the 1840s. The church contains some interesting 17th and 19th century memorials and a very rare example of a 16th century sexton's wheel. The wheel may have been used for determining the date of the Lady Day Fast. It is one of only two examples in the country. Round tower, apparently postdating nave west wall with early Norman arch. Remains of Norman chancel window. North aisle about 1320, south aisle about 1340, said to be parts of one building campaign that included the north chapel. Major remodelling in 15th century provided grand chancel windows, other windows, porch. Restoration in 1840s and early 20th century. Contains important 17th and 19th century memorials; reset woodwork; very rare 16th century sexton's wheel, a device for ascertaining the date of the Lady Day Fast. The only other example is at Yaxley, Suffolk. Early bell. E. Rose (NLA), 28 November 2005. A number of anomalies of possible archaeological origin were observed. These included discrete anomalies indicating buried foundations or possible burials in the south porch, north aisle and chancel area. A possible stone ledger with associated burial may have been dtected undereath the nave. The church is built of flint with ashlar dressings. It has a round Norman western tower with a later bell stage and short spire. It has an attached stair tower to the first floor where the clock is situated. The original tower arch survives. The nave has aisles with four-bay 14th century arcades and a later clerestorey. The chancel is of 14th century date but its fenestration is much later. The organ chamber is situated in the former chapel of St John the Baptist which was the chantry chapel for the de Bourne family. See (S5) for further information. H. White (NLA), 29 January 2009. 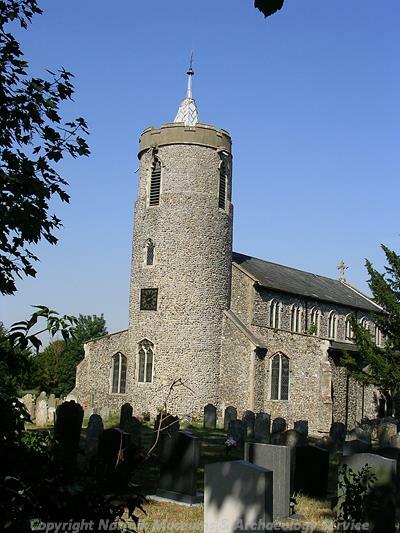 There are 119 examples of round church towers recorded in Norfolk. The tower contains six bells, dating from 1734, 1789 and 1904. The organ was presented to the church in 1893. H. White (NLA), 21 October 2009. (S7) states that the clock probably dates from the late 17th century. The date 1722 can be seen on the dial of the one hand clock but this probably represents a reconstruction. October 2009 - March 2010. Archaeological monitoring. A sequence of natural deposits, medieval grave and graveyard soils, post-medieval pathways and topsoil and a recent burial probably dating the 1940s were revealed. One medieval burial pre-dates the early 14th century buttress construction and is probably associated with the 12th century church. Evidence for the later renovation of the church was recovered in the form of brick buttress footings and medieval roof tiles used to build-up material for pathways. Finds included a 17th century clay pipe fragment and unstratified medieval and post-medieval pottery. S. Howard (HES), 16 November 2010. The six church bells need to be removed, repaired, re-tuned and re-hung. This is estimated to cost £32,000. H. White (NLA), 16 April 2010. --- Aerial Photograph: TM 1992C-E,G. --- Serial: Blomefield, F.. 1805-1810. An Essay Towards a Topographical History of the County of Norfolk.. Volume Unknown. pp 191-198. --- Illustration: Cotman, J.S.. 1804. Tower of St Mary's Church. --- Illustration: Ladbrooke. 1823. Long Stratton Church. --- Newspaper Article: Eastern Daily Press. 2010. Church bells will fall silent unless £32,000 is raised. 16 April. --- Leaflet: An Introduction to Stratton St. Mary Church.. Modern Press. --- Newspaper Article: Eastern Daily Press. 201?. The chime has come for bell restoration work. 11 January. --- Newspaper Article: Eastern Daily Press. [unknown]. Restoration work to start on church bells. [unknown]. <S1> Newspaper Article: Eastern Daily Press. 1984. Repairs to tower finished. 22 November. <S3> Unpublished document: Smalley, R.. 2007. Stratascan Report No. J2382. Geophysical survey report for St Mary's Church, Long Stratton.. September. <S4> Unpublished document: Reynolds Jury Architecture. 2008. Design and Access Statement, St Mary's Church, Long Stratton. <S5> Unpublished document: Heywood, S. (HES). 2008. Statement of significance for The Parish Church, Stratton St Mary..
<S6> Unpublished document: Unknown. Church guide to St Mary's Church, Long Stratton..
<S7> Unpublished document: Knight, G.. The turret clock at the church of St Mary, Stratton. <S8> Unpublished document: Kendall, R.. 2010. Archaeological Project Services Report No. 77/10. Archaeological monitoring and recording at St Mary's Church, Long Stratton, Norfolk.. September. <S9> Newspaper Article: Eastern Daily Press. 2010. Long Stratton: Vibrant and active village that's long on history. 1 September.